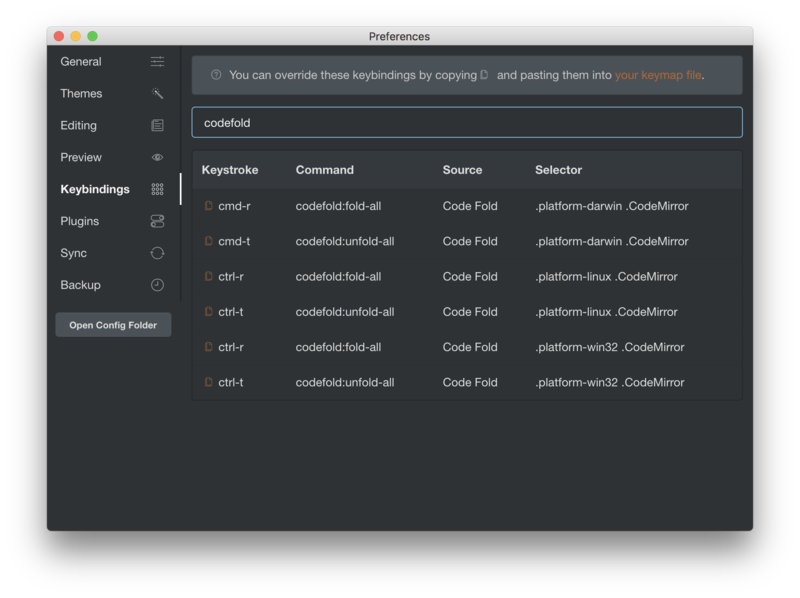 Hm, it looks nice but I guess the command name should be codefold:fold-all / codefold:unfold-all. Maybe export-print plugin would be helpful as an example. And I guess cmd-r and cmd-t are kind of too general key combination because it’s often used for reloading, running, compiling, tabs, etc. So other key combination would be nice like cmd-shift-o / cmd-shift-u. First, you should name commands starting with code-fold: which is your exact plugin name. Because the app tries to find commands that start with "<your plugin name>:" on your plugin detail screen. So please rename from codefold:fold-all to code-fold:fold-all. Second, I found a bug that keybindings on the plugin screen doesn’t show them correctly if a selector has a platform. I’ll fix it in the next release! Great! And v3.20.2 has resolved the second issue. Thanks again!